At least 20 injured after a canopy collapses at PM Modi's rally in West Bengal's Midnapore. Immediately the injured were taken to hospital on motorbikes by the ambulance that follows the Prime Minister's convoy. PM Modi later visited the injured in hospital. 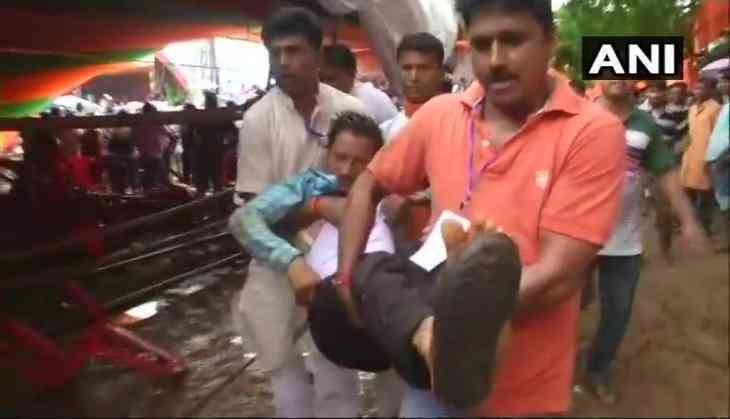 "Several injured after a portion of tent in PM Narendra Modi’s rally in Midnapore collapsed during his speech today. PM later met the injured in hospital," tweeted ANI. Reportedly, a portion of the tent in PM Narendra Modi’s rally in Midnapore collapsed during his speech today. PM instructed the SPG personnel to look after the people and attend to any injured. PM Modi stopped his speech to urge people to be careful, get off the stage and move to a safer area. "Those who have climbed up, please get down, all of you....please climb down. Those standing up there, please get down. Don't run," he urged. Many of the injured are believed to be women. PM Modi spoke for almost 40 minutes after his arrival around 12.30.